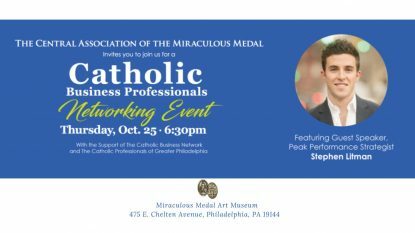 Thursday, Oct. 25, 6:30 p.m.
Thursday, Oct. 25, 9:30 p.m.
Join us on Thursday, October 25 for an exciting opportunity to meet and network with local Catholic business professionals! Tickets are FREE, and we invite you to enjoy complimentary hors d’oeuvres, beer, wine, and soft drinks as you browse our Miraculous Medal Art Museum. Don’t miss our featured guest speaker Stephen Litman, a Peak Performance Strategist on the Tony Robbins team with expertise in the areas of leadership, organizational behavior, psychology of achievement, and sales.